If a rock falls in the wilderness, but no one hears it, does it make a noise? I got back into the office today after my trip to the Bay Area and eventually heard that there had been another substantial rockfall in Yosemite early Saturday morning (March 28). The NPS Geologist made a statement, posted it to Supertopo.com, and the story has been picked up here and there by news organizations, and blogs, but didn’t have much widespread coverage. The AP finally picked up the story today – 3 days after it happened. This weekend, Sarah Land at Land of Locks helped me donate my hair to Locks of Love. I found out about Locks of Love when a couple of friends mentioned that they were donating their hair to an organization that provides hair prosthetics to children who are suffering from long-term medical hair loss. Since then, have been surprised at how many other people I know have made the same decision at some point. Locks of Love requires that the hair is at least 10 inches long – so the cut is usually a dramatic one, and since I’ve never done it before I was really looking for someone who knew what they were doing. Fortunately, Sarah was recommended to me by a mutual friend who has excellent taste, so I felt confident that I was going to get a great hair cut, and that the 3.5 hour drive into the Bay Area was worth it for her expertise. Besides, it is always fun to have a chance to visit friends, check out my old stomping grounds, and do ‘city things’. So far we’re 29 days into Lent, and I’ve managed to get a blog post in each day. I’ve missed a few days, and had to back-date, but I’m still at one-for-one, and I usually get that nagging lagging post in the next morning. It’s a lot more writing than I’ve really ever done before, and the great thing about it is that it seems to be getting easier with each day that goes by. Ideas for things to write about come at me faster than I can get them down. (Knock on wood that it continues.) The conservative part of me is saving those posts for use on later days when I can’t think of something else to say, or don’t have time to get something down, but the longer this goes on, the easier it is for me to build up a surplus of ideas. Sometimes themes crop up in my life. A while ago it was Gratitude, and all the things I have to be grateful for. Lately, it seems to be ‘measure to manage’. The idea is that once you have a way to measure something, it becomes easier to figure out how to attain it. 1. If you haven’t been there already, you should check out MapJack.com. 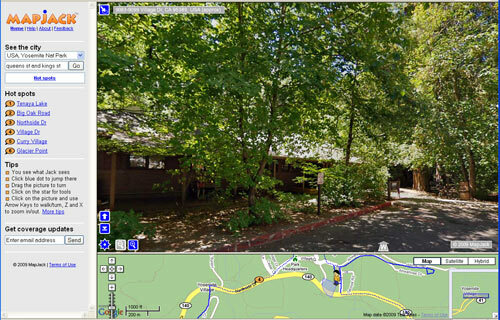 They have a really cool street-view map of Yosemite, and I love their interface. Click on the big picture to pan left or right, and you can move Jack around in the lower map area to explore different things. Very similar to Google Maps street view, but it seems to work a bit more smoothly for me. At one point there was a group of us standing around the computer together joking “hey, that’s the RV I rented, hey, that’s my car…” when we panned a little left and CA cried out “OMG – that really is my car.” We checked it out from a couple of different angles and verified. Immortalized! 2. On a completely different note: There was a car fire here today that destroyed the vehicle of a Valley local. No one was injured (thankfully), and after they put the fire out, they realized that the fire was started by a stash of pine cones in the engine compartment. They suspected some squirrel had been storing food there over the winter. Many people in Yosemite end up parking their cars for a long time – so many things are within walking distance and there are public transportation options available. Still, it was a bit of a shock. Living in the mountains means that we’re used to thinking about things like loose rock, lightening, and snowstorms but so far “car fire due to rodent cache” has not really made the radar. Amazing stuff happens here. I am so excited to be packing tonight for a trip to the Bay Area this weekend. I’ve made an appointment to get my hair cut for donation to Locks of Love, and I can’t wait until I’m free of the burden of these long locks. I’ve tried the super short cuts before and they don’t look that great on me, so I’m not shaving my head or anything drastic like that, but cutting 10″ off is going to be dramatic anyway. 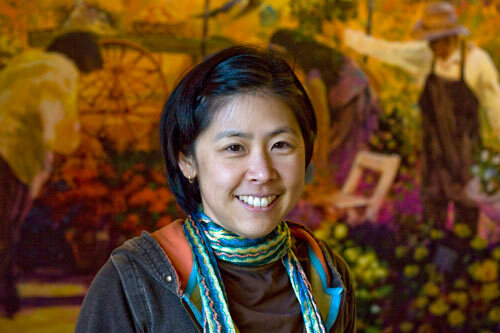 Plus, a trip to the Bay Area is a great opportunity to connect with friends, and do some of the city things that we don’t get to do around here, like eating ethnic food, going shopping, or to the movies. I’m really looking forward to a few days ‘away from it all’, but I’m also a little sad to be missing the great things going on in the Park this weekend. As long as I’m going to be very particular about what kind of wine I like and don’t like, which I seem to be, it only makes sense to try and get a little educated about it. We are lucky, in Yosemite, to host fine dining events like Vintners’ Holidays once a year, and the wine tastings associated with that event are incredibly educational, as well as delicious. 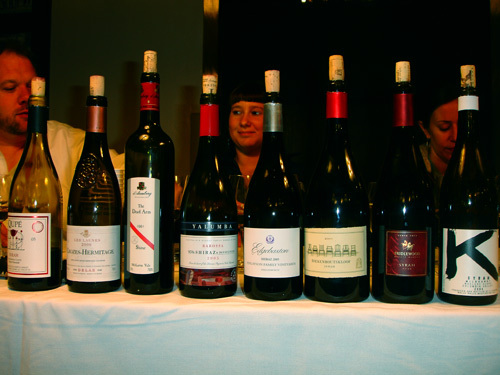 Plus, some of the wines served are often expensive and quite rare. However, for a novice wine appreciator (connoisseur seems a little high-brow for where I’m at in my wine education), the conversation surrounding those wines is often at a much higher level than I’m prepared to engage in. Fascinating, but over my head. Introduce the budding wine club that started just last month. Led by people who are studying for their Master Sommelier exams, it makes a great blend of people with a great deal of expertise with those of us who are barely able (or unable) to tell a Cabernet from a Merlot without reading the bottle. I went to my first session tonight, and we tasted Syrahs from around the world. Tom has been bugging me for a while about how much protein I don’t eat. I keep telling him that I am not vegetarian, so probably my protein intake is taken care of, but then he points out that when we eat together, I always eat vegetarian because he is, and since I wrinkle my nose at protein supplements I sometimes get less than he does. So, I decided to try to find out exactly how much protein I’m supposed to get and start keeping score. After finishing “How to Be Good ” by Nick Hornby late last night, I am further from understanding how to be good than I ever was. Nick Hornby is also the author of other piercingly observant, and enjoyable books like High Fidelity , but he writes a lousy how-to manual, instead raising questions about the goodness of being good. I know – that’s the point – and I get it, but it’s like someone opening the blinds or turning on a bright light in the morning. It’s good for me, but really, I was enjoying my sleep. Yesterday, spring. 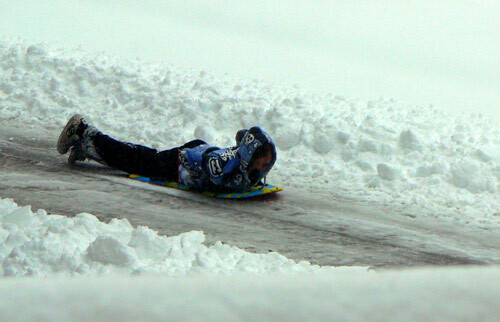 Today, sledding in the street. Yesterday, it was spring – warm weather, wildflowers, sunshine. This morning, I woke up and there was a kid sledding down the street in front of my house. Just a reminder that weather can change quickly in the mountains, and just because the calendar says it is now spring, doesn’t mean diddly squat in terms of what to prepare for outside. This morning Badger Pass was buried under 18 inches of new snow (at 7200 ft), we had around a foot here at our house in Yosemite West (~5300 ft), and someone in the Valley said that they even had accumulations of 5 inches or so. I wonder if it snowed down as far as the bright fields of poppies that everyone has been so crazy about lately, and also whether any intrepid soul managed to get a picture of the poppies with some snow on them. That would have been a unique picture to get. There was, unfortunately, so much snow that Badger Pass didn’t open today – much to the chagrin of DP who is here from FL and was hoping to get a day of skiing in during his trip. I hope he’ll be able to squeeze some time in tomorrow to get a few runs. Tom and I are planning to have dinner with him this evening at the Mountain Room. I love the food at the Mountain Room, and I’m looking forward to that for sure!